Brand Identity: Brand Extension, Brand Diluton? 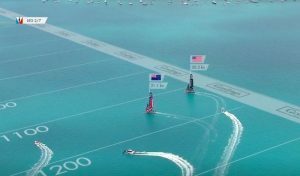 Ask Jack: When and where will the next America’s Cup be held? 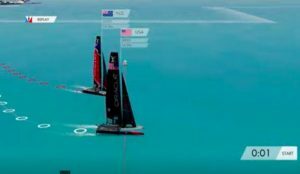 If the 2013 America’s Cup seemed like „The Empire Strikes Back,“ 2017 gave us „Return of the Kiwis.“ Peter Burling’s Luke Skywalker vanquished Larry Ellison’s Darth Vader racking up eight race wins while Oracle could manage only one. 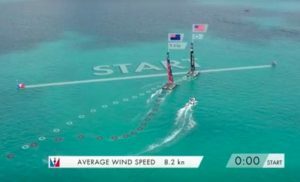 Jimmy Spithill and the Oracle crew seemed to succumb to Jedi mind tricks, losing seven of the nine starts, going OCS in two races, sailing out of bounds once, misjudging laylines both upwind and down and falling off their foils in several tacks and gybes. 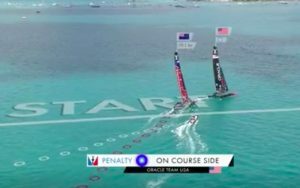 The Match started out badly for Oracle when they were over the start line early in the first race. The following Saturday, Oracle was again OCS, in Race 5. 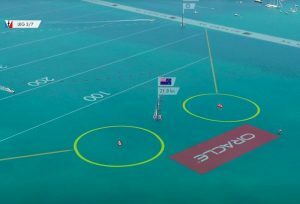 On Sunday 25 June at the start of Race 7, Oracle seemed to be in a strong position to weather of New Zealand and faster. 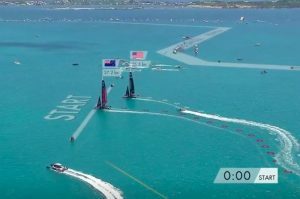 But three seconds before the start, Oracle helmsman Jimmy Spithill made a quick turn to starboard, slowing the boat and handing control to the Kiwis. Start Race 7In Race 7 Oracle crossed the line over a boat length behind and slower than the Kiwis. In the pre-start of the second race on Sunday 25 June, things went even worse for Oracle. 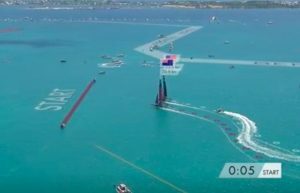 Peter Burling hooked Oracle to leeward and forced them almost head to wind before speeding off to big lead at the first mark. In this photo, Peter’s left hand is reaching for the protest button. The umpires green flagged the incident, but the damage was done. 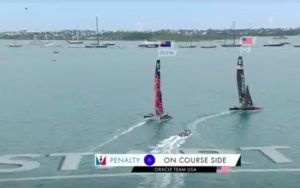 After their poor start, Oracle compounded their problems by going outside the boundary and picking up a penalty at the top of Leg 3. Losing Race 8 put the Kiwis at match point. They closed out the win the following day. In the final race, Oracle got a good start and led at Mark 1. 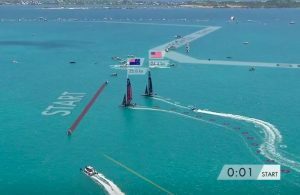 But when both teams gybed at the boundary on Leg 2, the Kiwis moved into the lead with a better gybe and stretched out their lead to win the race comfortably. 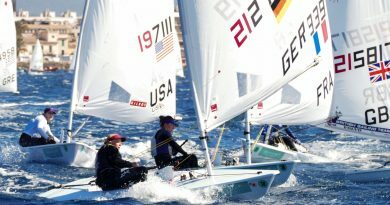 Oracle led to the boundary on Leg 2 of Race 9. New Zealand executed a flawless gybe while Oracle’s was a bit slower. The Kiwis took command before the first leeward gate, and stretched out their lead from there. 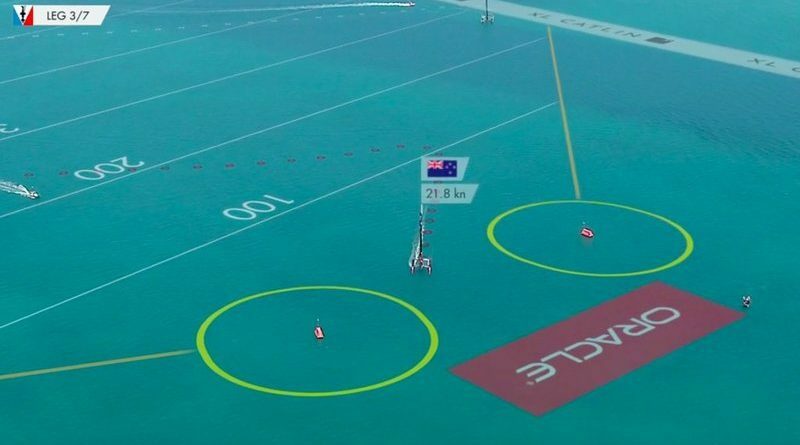 How Good Were My America’s Cup Match Predictions? Neither team will sweep the other – it will be a back and forth battle. Not so good. Oracle managed to win one race out of nine – hardly a back and forth battle. 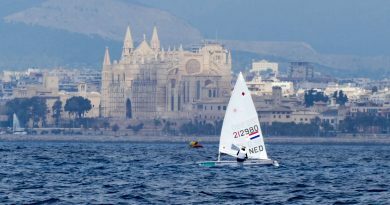 The racing will be intense, with frequent lead changes after the first downwind leg. 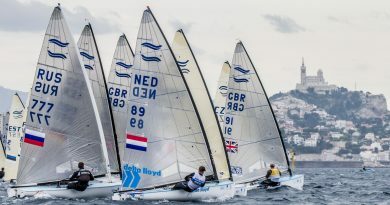 The first boat to Mark 1 – the end of the short blast reach after the start – will almost always be leading at Gate 2, since there are few passing opportunities on the short first downwind leg. It will come down to sailing – how well the teams execute their maneuvers. Mostly right. New Zealand was faster in the first four races, but Oracle made their boat faster between the two weekends of racing. 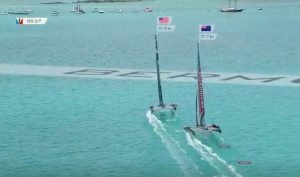 Oracle’s errors – starting, tactics and boat handling – made things easier for the Kiwis. Oracle’s Jimmy Spithill will be very aggressive, especially in the pre-starts. 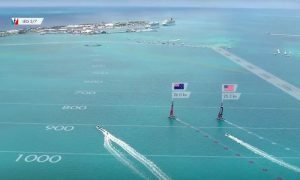 America’s Cup Identity – Brand Extension or Brand Dilution? Louis Vuitton designed their own logo for the event, which ACEA was not allowed to use on clothing or merchandise. 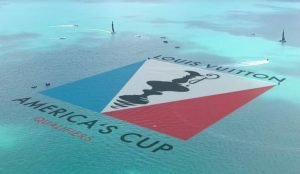 Vuitton’s LV symbol was used on the wingsails instead of the traditional America’s Cup symbol. 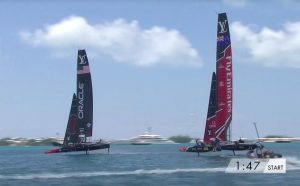 When Oracle and Emirates Team New Zealand faced off, it appeared that Louis Vuitton had become the „title sponsor“ of the America’s Cup Match. Oddly, no one presented the trophy to the Kiwis. 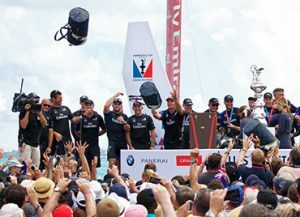 It was brought on stage by its „body guards.“ At the prizegiving ceremony, before they were allowed to touch the America’s Cup, the Kiwis were presented with Louis Vuitton bags and instructed to hold them up for a photo op. Several team members decided to toss their bags to the crowd. Standing in the crowd was Luna Rossa owner and Prada CEO Patrizio Bertelli. I got a chance to congratulate him on being the new Challenger of Record.